The Panthers have re-signed running back Elijah Hood to a one-year deal, the club announced today. Wood had been scheduled to become an exclusive rights free agent this offseason, so he wouldn’t have had the option to leave Carolina unless the team opted to non-tender him. Hood, 22, entered the NFL as a seventh-round pick of the Raiders in 2017. While he didn’t make Oakland’s 53-man roster at the outset of his rookie campaign, Hood signed with the Raiders’ practice squad and was eventually promoted in for one week that October. After being waived the following May, Hood was claimed off waivers by the Panthers. However, he spent the entire 2018 season on injured reserve after tearing his ACL on a preseason kickoff return. Carolina’s backfield was dominated by Christian McCaffrey — who played more than 90% of the club’s offensive snaps — last season, but Hood could compete for backup duty. 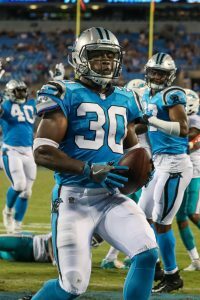 Travaris Cadet, Kenjon Barner, Cameron Artis-Payne, and Fozzy Whittaker are all unrestricted free agents, leaving 2018 undrafted free agent Reggie Bonnafon as the only other Panthers back under contract alongside McCaffrey and Hood. The Panthers also acquired offensive lineman Corey Robinson from the Lions earlier today. The 26-year-old had spent his entire three-year career in Detroit, starting eighth of his 23 games. Carolina sent Detroit a conditional 2020 seventh-rounder in the deal. Here are today’s practice squad transactions.